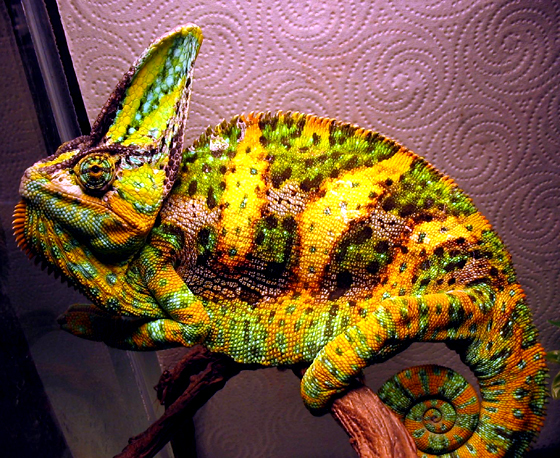 Animal Wildlife | Chameleon | The chameleon is a very distinctive and well-known species of lizard, due to the large eyes and curled tail of the chameleon. Chameleons are found throughout jungle and desert alike, in Africa, Asia and parts of Southern Europe and chameleons have also been introduced to parts of North America. There are thought to be more than 160 different species of chameleon that range from just an inch to more than a couple of feet in size. The tiny pygmy leaf chameleon, found in the jungles of Madagascar, is the smallest species of chameleon with some males measuring less than 3 cm long. The largest species of chameleon, the Malagasy giant chameleon, is also natively found in the jungles of Madagascar and can grow to nearly 70 cm in length. Parson's chameleon, also found in Madagascar can grow to around 65 cm in length. Some species of chameleon, although not all, are able to change the colour of their skin in order to be camouflaged into their surroundings. These colour changes in the chameleon's skin colour can include colours such as pink, blue, red, orange, green, black, brown, light blue, yellow and turquoise, all so that the chameleon can blend in more easily. 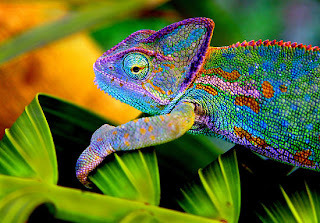 The chameleon has exceptional eyesight for a reptile as the structure of the chameleon's eye, allows the chameleon to have complete 360 degree vision around it's body. 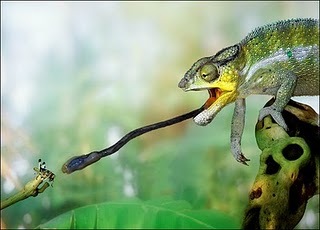 This special adaptation, allows the chameleon to be able to hunt prey and spot predators more effectively. The chameleon is generally an omnivorous animal, although some chameleon species are known to have a more carnivorous diet, and other chameleon species prefer to be vegetarians. A chameleon will generally eat anything though including berries, leaves, fruits, insects, worms, snails and some of the larger chameleon species will also hunt small reptiles. 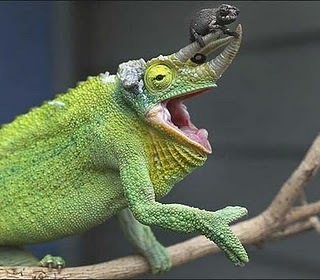 Due to the generally small size of the chameleon, they are often a prime target for hungry predators (when the chameleon can be seen that is). 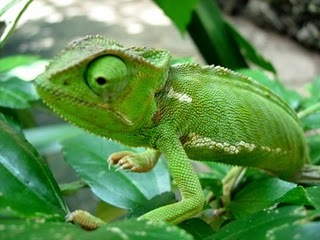 Other tree dwelling animals such as snakes and birds are the most common predators of the chameleon, along with some mammals. In order to bury to her eggs to keep them safe and warm, the female chameleon firsts digs a hole in the forest floor in which to bury them. 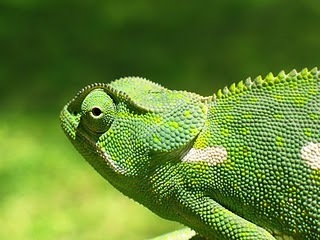 The hole can be from 10 to 30 cm deep, but the depth of the hole generally depends on the chameleon species. They look weird to me, but they are useful in the eco-system.